The Primary Montessori program is for children between the ages of 3 to 6 years: preschool to kindergarten. The mixed-age grouping fosters opportunities for collaborative work, social engagement and for older children to learn to help the younger children. The continuity of returning to the same room each year makes for a strong classroom community, for children and parents alike. Each 3 – 6 classroom has a selection of activities of daily life that aid in the development of coordination, concentration, order and independence. The environment in this classroom is designed to encourage each child to move, touch, and manipulate. The specially designed, hands on Montessori didactic materials invite children to engage in learning activities of their own individual choice. The children have freedom to work independently, based on their own initiatives with gentle and respectful guidance from their teacher. Little Gems Montessori embraces Dr. Montessori’s ideal that the child’s learning experience should occur naturally and joyfully at the proper moment in the prepared environment. The Practical Life curriculum is the cornerstone of the Montessori method. Its goals span the three-year age cycle, providing practical experience in everyday activities. These activities not only teach physical skills, but also prepare the children for subsequent or concurrent work in mathematics, language, and socialization. The necessity of making choices and using coordinated movements to accomplish a task leads the child toward self-regulation and independence. The ultimate lesson, however, is concentration-without it, nothing else is possible. Maria Montessori proposed that logical thought stems from the human mind's ability to organize and categorize. The aim of the math curriculum at Little Gems primary level is to help students develop their thought processes, not to simply teach math facts at an early age. With hands-on materials, students begin to understand the concrete through manipulation, experimentation, and invention, which prepares them for abstract study at the elementary level. Goals: Establish numbers one to ten. Understand quantity and sequence of numbers using manipulatives. Establish recognition of numerical symbols. Learn relationship of quantity to symbol. Goals: Understand the concept of base ten. Learn composition of numbers, including place value and equivalencies. Goals: Ability to recognize teens and tens. Goals: Develop ability to recognize and count to any number. Learn skip counting. Goal: Provide a concrete introduction to the four basic arithmetic operations. Moves into abstract work with operations. Children are learning language long before entering the Montessori classroom. By using their senses as tools, children absorb information about their language. During the first two years of primary classroom, students prepare themselves for language study by working in the practical life and sensorial areas with materials that refine auditory, oral, visual, and sensory/motor skills which are necessary for writing and reading in the third year. Language spans every other area as an integrated source of preparation for a well-planned approach to further learning. The science materials live in the cultural studies area in our primary classroom. Maria Montessori had a unique way of defining cultural studies-she incorporated the specific areas of history, geography, physical sciences, botany, and zoology into the studies within this area. These components support Montessori's strong belief in the need for global education. Exploration and inquiry are encouraged by fostering and nurturing the young child's curiosity. By exploring in the cultural studies area the child defines his individual spirit as well as a sense of wonder of people and the world. Through sensory experience and the use of imaginative stories, children in the Montessori 3-6 environment learn about their physical world. They can touch a sphere and compare the shape to the globe. They build landforms using play dough and fill water forms with water. Montessori puzzle maps are meant to be taken apart and put back together again as children develop an understanding of continents and oceans. 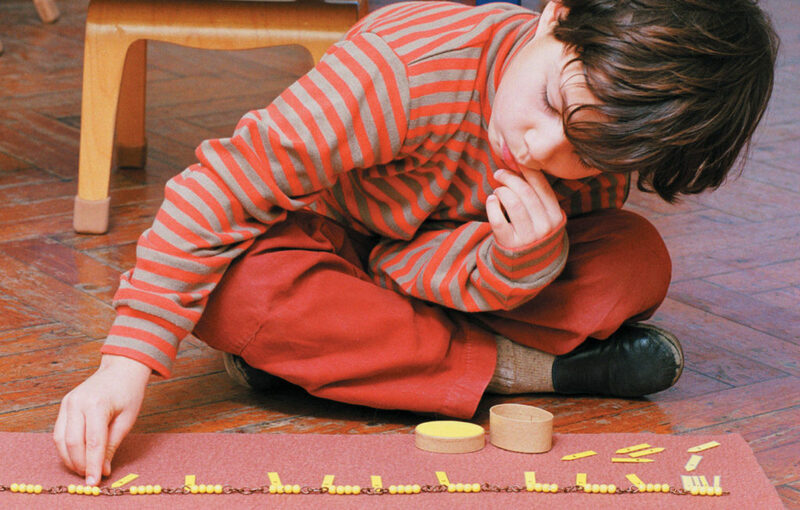 These Montessori hands-on activities build long term memory by physically engaging the hand. Discoveries are made about the people who live on different continents. Montessori students learn about food, music, clothing, traditions, holidays, customs, housing, as well as the plants and animals of the region as they compare their lifestyles to others. They learn about the flags of the world and reverently carry them as they “walk the line” in the Montessori prepared environment. They learn to appreciate the wonder found in the similarities and differences found around the world. The music curriculum combines individual and group work with work designed to appeal to a variety of learning styles. This directly relates to our philosophy of enhancing the Montessori philosophy with other innovative methods. The arts program seeks to foster creativity, problem solving, and self-expression as it relates to each child's level of development. Art lessons use a variety of auditory, kinesthetic, and visual components. Students are encouraged to experience the art process as each concept is presented utilizing a variety of materials to help them truly absorb and understand the lesson's objectives. Lessons include drawing, painting, sculpture, collage making, and print making. The curriculum focuses on exploration of materials. The Spanish program is designed to enable students to speak and write their basic thoughts and questions in a second language. The curriculum utilizes a combination of speaking, writing, and activities that are often based on music, art or Total Physical Response. Students learn to express themselves in a second language environment that promotes confidence and creativity.